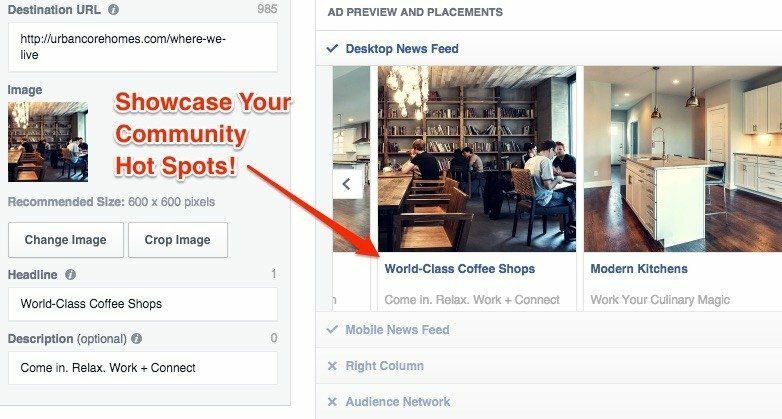 Recently, I shared the good news that Facebook is allowing multiphoto ad sets, which is fantastic for real estate agents. Now you can include up to five images and create a gallery effect. Each image has its own link, headline and description. Although this might sound like overkill, it’s an opportunity to tell the story of the home you’re selling. When you upload the images, you have 25 characters for the headline and 30 for the description. The main ad text is 90 characters of space; this is your space to talk about the primary theme of the story. This text is an excellent way to be hyperspecific about the features and benefits of the home. See how each image has its own headline and description? This text is an excellent way to be hyperspecific about the features and benefits of the home and surrounding area. Remember, the main text is the primary theme, the individual pictures are where you tell a story. When you’re selecting pictures, focus on telling a story. Put your reader in the home by showing the kitchen, the living room, yard or master bathroom. Don’t make the mistake of making the ad about you selling the house, but rather create a little snapshot of a place the buyer can imagine living. Create a little snapshot of a place the buyer can imagine living. I also encourage you to include a headshot of yourself, with a link to your profile that shares your story, as well as what motivates you to help people find the right home. Remember, with unique headlines and descriptions for each image, you have the freedom to make this a reality in your ads. Using an image to showcase the surrounding area is an excellent option for helping buyers see how great the community is. Highlight a local park, school, festival, restaurants, shopping, sports teams — whatever is the best fit for the home you’re marketing. Highlight schools, local stores — whatever is the best fit for the home you’re marketing. Pro tip: Create a page on your site that showcases each neighborhood and why it’s great to live there. Then point the link for this image to the page on your site, so readers understand the value of the community. If you’re using the same homepage link for each page, you’re missing out on critical conversion. Make sure the links point to the page the home is listed on, along with specific links to your “about” page and “neighborhood guides” (see above). Pro tip: If you want to see quality conversions out of your landing pages, create pages specific to the site you’re linking from. If you want to see quality conversions, create pages specific to the site you’re linking from. For example, when I changed my linked bio page to be specific to Inman readers, my conversions jumped from 14 percent to 48 percent. A few little extra things to keep in mind as you’re putting together your ad images. Image size is 600×600 pixels, not the usual 1200×628. Personally, I don’t see the point in right-column placement or partner site placement for carousel ads. I uncheck them and save my ad dollar for desktop and mobile news feeds. If you’re able to put a conversion pixel in the code of your page, grab it from the ad center (it’s available when you start the ad process) and insert between the <head> tags. If you look at code and your head hurts, send it to your webmaster. If you’d like to learn more about conversion pixels, send me an email, and I can help. In summary, always remember your ads should be designed to deliver value to your readers and build trust. Carousel ads give you a unique opportunity to put your readers in the home you’re selling. Take them deeper by sharing your story and telling them why your community is such a special place to live. 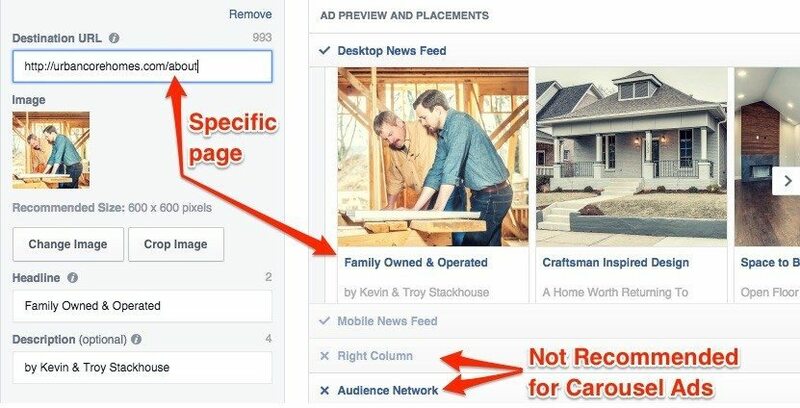 Finally, don’t forget to do the little things that help a Facebook ad show well and convert effectively. 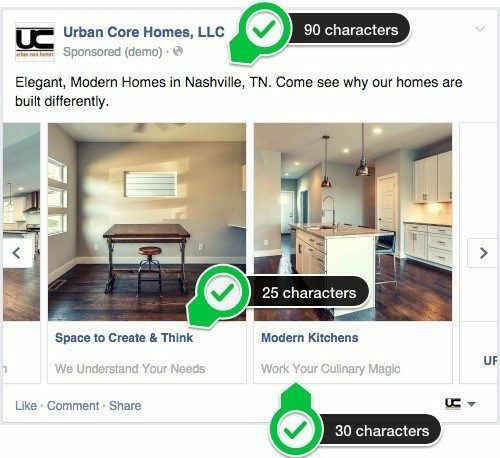 As a special for Inman readers, I’ve created a handy PDF checklist you can download to help with your Facebook ads. Click here for instant access. Matt Ragland is a content strategist based in Nashville. As a special for Inman readers, visit EngAgentCourse.com/Inman for a free guide to content marketing and social engagement. You can also follow Matt on Twitter at @MattRagland.